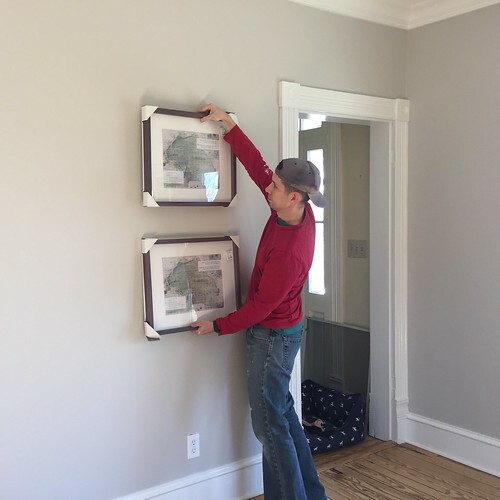 Now that the two and a half year long renovation of our new home's living room is nearing completion, it's finally time to launch into the decorating phase. And while the thought of that excites me to no end, it's also somewhat terrifying. Getting started always seems like the toughest part. But luckily I've had quite some time to obsess think about it and plan for this phase of the renovation. So where did I start? 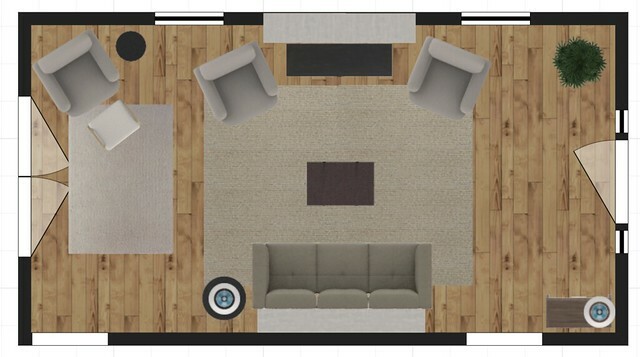 With a floor plan, of course, as having a well defined but flexible plan provides me with a roadmap to get me from start to finish on any room's design. 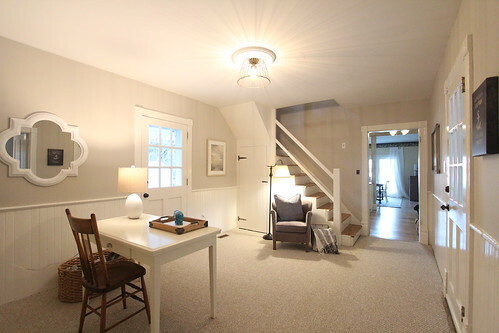 A makeshift "foyer" in the area near the front door, complete with an overhead light fixture and piece of entry furniture to drop keys, etc. 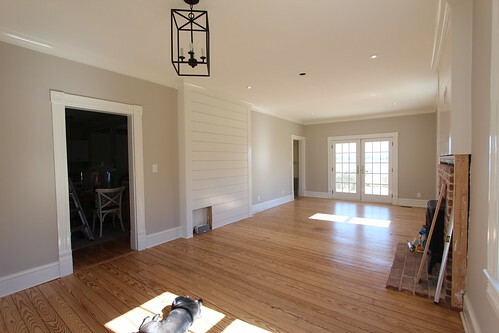 The main space centered on the fireplace, perfect for entertaining, conversation, enjoying a fire, and watching television. 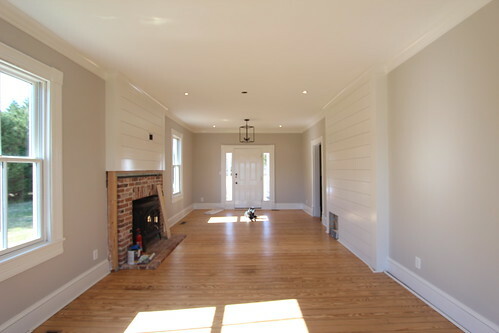 This space will feature a long, comfortable sofa, a coffee table, and a chair on either side of the fireplace. A reading nook zone with a comfortable chair, ottoman, and side table, nestled next to the French doors, to serve as a place to relax and read, take in the view, or enjoy a cup of coffee or glass of wine. To visually separate and anchor each of these spaces, I started with floor coverings. For now, the foyer will remain bare wood (or will have a small entry mat when I find the right one), the main space will be anchored by a 9' x 12' rug, and the reading nook will rest on a 6' x 9' version of the same rug. The accent colors in the room will be various shades of blue (namely aqua, turquoise, and navy), and metal accents will largely be black or oil rubbed bronze. I'd like the look to feel light and fresh, but at the same time incorporate antique, second hand, one-of-a-kind, and interesting pieces to make the overall look feel layered and collected, rather than something that looks like it was purchased straight off the pages of a catalog. We'll also be mixing high, low, and no cost items to keep our budget in check. While I want the furniture and fabric to be of a good quality, comfortable, and stand the test of time, I also don't want anything to feel off limits or too precious (and know that Lulu's penchant for swimming in the river is something we have to take into consideration). And finally, just because we have the space, doesn't mean we have to fill it up with stuff. I'm taking a more minimalist approach, not in a modern sense but in that I want the home to feel uncluttered and clean. Most of these items we've already purchased with the biggest exception being the two chairs for either side of the fireplace, and unfortunately, there's a story there. Do you remember one of my initial concerns of buying furniture that didn't work? Well, the cute gray chair in the office is the product of such an error. Roughly two years ago we bought a pair of these petite gray velvet chairs from the Restoration Hardware Outlet. They're comfortable, well made, the right color, were on sale, and...were final sale. It wasn't until our new Pottery Barn sofa arrived that we realized the chairs are much too small in scale in the room when partnered with the sofa. So, long story short, we'll use the chairs elsewhere (such as the office) and the hunt continues for the perfect chairs for either side of the fireplace. In spite of the chair misstep, we're down to the final punch list for the room and work is underway building the fireplace mantel, and then we'll be able to call the room done before the warmer weather brings with it a steady stream of visitors and guests. It will be so amazing to now have three rooms on the first floor—the living room, downstairs bathroom, and office—in a state that we're proud of. We look forward to continuing the momentum into the other rooms downstairs, transforming it all into a seamless, cohesive look that is a reflection of our taste. But before we get to that point, we can't wait to enjoy what we hope will be a relaxing, comfortable, cozy, and welcoming living room. 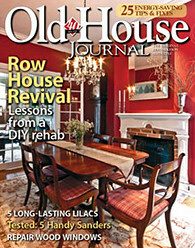 We still have a long road ahead of us until we feel great about the house, as there is a lot of restoration and renovation work, and reminders of the last major renovation in the 1980s that we plan on addressing. 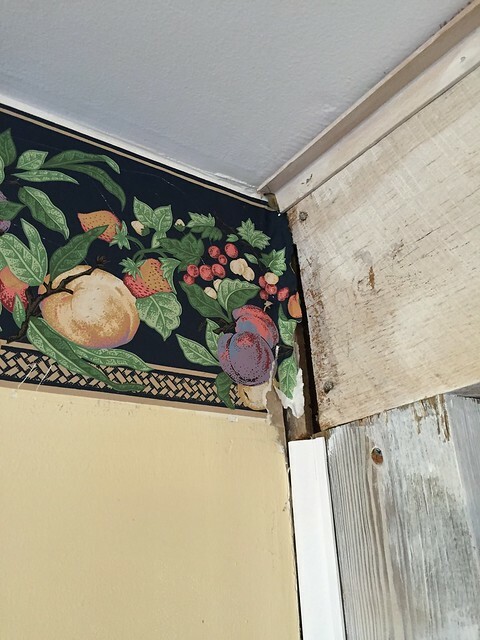 I mean, dining room fruit wallpaper border? Just as soon as we finish the hallway, I'm coming for you. But as they say, slow and steady wins the race. And we definitely have the slow part down pat. My parents have a pair in their own nook where they drink tea each morning. They are the most comfortable chairs I have ever sat in. Oooh, this is getting so fun. 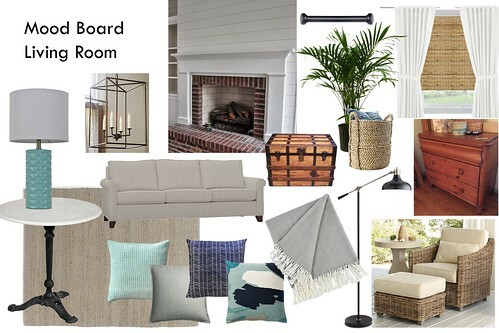 Looks like you have a great plan for open, airy, yet cozy decor. I like how Wendy has a chair by the view for wine/tea. What about Alex? Or will he be too busy serving said beverages? The only down side is that I'm not on the family/friends guest list;) Oh well, just be kind and keep the posts coming. I had that same wallpaper border in my dining room in the early 90s. I think it was from a Natchez catalog. I'm sure that whatever you do will be much better . I love everything so far. Thanks. That's so funny, Priscilla! It must have been really popular, because it's also the same border my family had in our house growing up. My mom had it hung in the early 90s in the kitchen with the walls painted pink at first, and then later with a softer peachy paint shade. Classic. Ah yes. 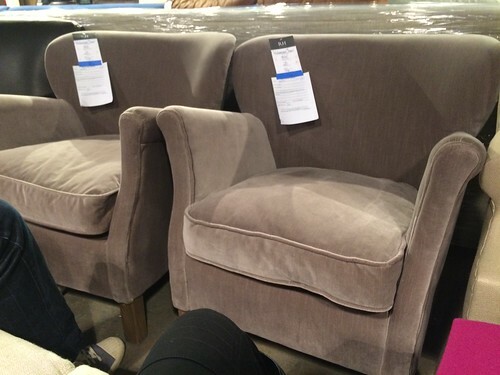 The Restoration Hardware Lilliputian Chairs. My husband and I had a similar experience with the leather ones. I saw the Redskins linebacker- sized guy bringing them off the truck - practically one in each hand. Everything is looking great at your place. Love the colors and vibe. You are getting it so right!! Can't wait to see how the room turns out.